Pullman Bali Legian Beach is a beach front resort in an urban chic style, located between the exciting Kuta and Legian Beach, only 20 minutes drive from the Ngurah Rai airport. Welcome was acceptable Room upgraded but room situated at the ground floor (loud and mosquito) and dark Quality and availability of breakfast should be improve Cleanliness of room and bathroom (plug). Our stay at the Pullman was special. Our 20th Wedding Anniversary. We were spoiled by the staff. (Especially Aryian) Suite was fantastic. Roomy and overlooking pool and ocean. Relaxing at the Rooftop pool was beautiful. We would like to seen Poolside towel removal policed better and some more night time entertainment ie Balinese Dancers. Amazing property. Would ha e preferred if the infinity pool was child free though. Also air con in the room was less than average. Great breakfast buffet. Staff all went out of their way to help with any questions we had. It makes me a warm, comfortable and special place while I was away from home. Breakfast services, housekeeping and security services are satisfactory. I was very satisfactory especially in providing meals during breakfast and lunch. I also recommend the sincerity of house keeping servants during my stay there. Arrived @ Pullman about 7.00pm on Sunday 31 March ! feeling tired we were greeted by friendly Inka Mazaya - so efficient & prompt service - we rewarded with upgrade to beautiful room 1540 ! WOW ! double rooms / 2 bathrooms , which made my wife very happy for our Wedding Anniversary Celebrations ! Great start to our holiday week ! Also on Monday Anniversary Cake - thank you Pullman . Breakfast time was superb buffett / great service by all the staff . especially by Friska + Nikita - by request Hash-Browns when ordered , well done . Also room-service very good selection & value . Also housekeeping every morning very quick & clean service 5 out of 5 - always polite . So , Sunday am time for check-out - sooo sad ! Inka was on duty for efficient check-out , paid bill , all good - will miss Inka's big smile & friend Made . Look f/fwd to next visit in Sept-Oct 2019 ! Thank you Pullman for most enjoyable time / recommend to all our friends in Perth . Christian & Janice Z. . Exceptional service, top quality amenities, great value for money holiday. This holiday was our 3rd return trip to Pullman Legian, and we will definitely return again next year. As an Accor silver member, we were treated exceptionally well from arrival to departure. My husband and I LOVE this hotel. 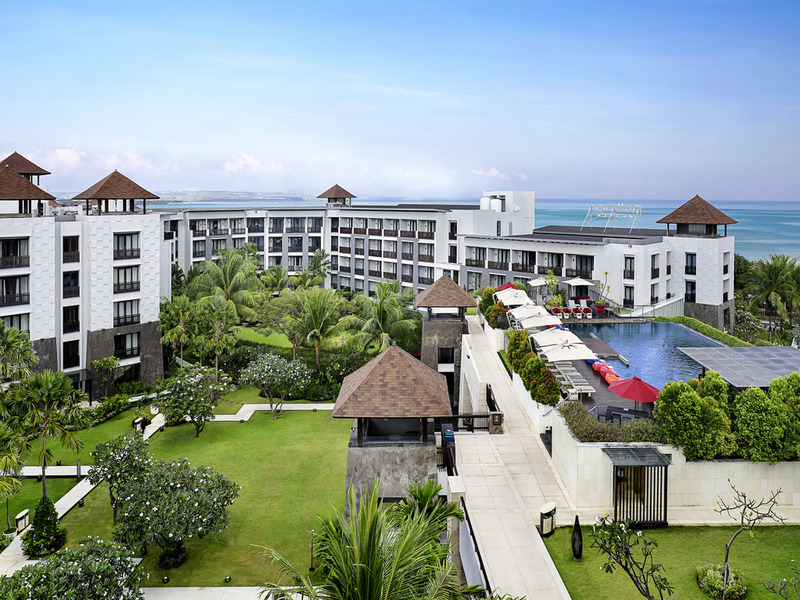 We have travelled to Bali on at least 8 occasions, staying at a variety of locations and hotels in Legian, Sanur, Seminak, Ubud and Nusa Dua, but since discovering The Pullman Legian in 2017, we have had 3 return visits and have never been disappointed. This is our holiday of choice due to - beautiful rooms and onsite facilities, excellent service throughout the hotel, high quality food and beverage and outstanding value for money. Every time we return to The Pullman we stay longer, this year for 10 days. All staff at the hotel were so obliging and friendly, and special mention must be given to Wila, Fina, Haity and Benny in the Deli Restaurant who always look after us so well each time we holiday at The Pullman. While staying at the hotel, we stay within the resort and eat ALL our meals, breakfast, lunch and dinner at The Deli or IP Bar, and we also enjoy the themed buffet dinners, especially the Italian night on Wednesdays. We really enjoy the live bands and entertainment at The Pullman. Special mention and thanks to the new Chef, who really ensured that we enjoyed every single meal. He even met with us on a few occasions to check that we were enjoying our meals. A lovely surprise was when Chef organised a special complimentary farewell dessert for us on our last night - he organised for the pastry chef to prepare an Indonesian layer cake for us, and it was absolutely beautiful! The staff at The Pullman certainly ensured that our holiday was perfect, yet again. Thank you, thank you, thank you! Staff, food, accommodation, great. a very positive holiday. Issue with a king bed being 2 singles overcome quickly with upgraded room change. Courteous management and floor staff. Quality fitness facilities. Maybe an opportunity to sell to non guests. Great experience, lovely rooms, great surroundings....and finally wonderful staff, and ideally located. Our daughter had a fall at your kids pool which we found very dangerous, to have such a sharp pointy concrete edge on a children’s pool seems ridiculous and extremely dangerous this accident as bad as it was could have been so much worse if our daughter had hit her head and not her mouth which in itself was bad enough knocking out her teeth and cutting up her mouth very badly, so the majority of the time we should have been at your hotel we spent on hospital. We paid to upgrade our room as we found it too small once the rollaway bed was added and the new room was lovely and spacious but as I said we never got to use it so might have been a nice gesture to refund what we paid to upgrade. The staff at your hotel were amazing though and we can’t thank them enough for the help they gave us especially Amy who went above and beyond to help us out at such a difficult and frightening time nothing was too much for her she assisted with hospitals checked on a regular basis to see how we all were which meant so much to us. The hotel in general was lovely but we had very little time to really enjoy anything there and I really think the kids pool needs something done to fix it our daughter could have died if she had hit her head in the wrong spot. We understand accidents happen but if the sharp concrete edge was not in the pool our daughters injuries would not have been as severe and we would not have spent so many nights in hospital. We bought a luxury escape package to relax at the Pullman and that’s exactly what we did...the place & staff was amazing , we would definitely go back. Location: Great. Cleanliness: Spot on. Comfort: Good (beds and pillows not to our liking but everything else was wonderful) Breakfast: Good (service was here and there, sometimes we got our tea when asked but sometimes we didn't- but GRANOLA BOWLS WERE AMAZING!!) The one thing that stood out was the connectivity room and the ability to access it on the day we were flying out. It gave us somewhere to go and was the cherry on top of our stay.